Have you ever seen them before? This is a first for me. 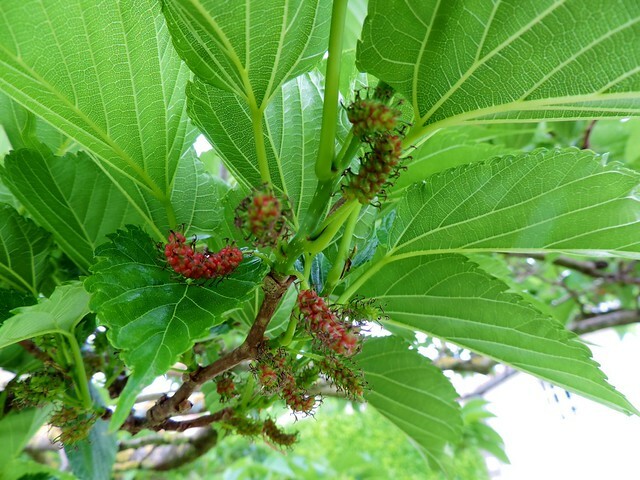 We’ve a mulberry tree in our garden in France and as this is our first year here, we’re watching it change through the seasons. And here comes the fruit. Don’t they look like little creatures? How often do we see that in Nature, where some kind of organism develops the characteristics, or features of another? I love how we can see such inventiveness and rich variety in Nature. We had one in our backyard when I was young. We children used to climb and pluck the mulberries during our playtime breaks! My brother never ever tasted mulberries because to him it resembled to worms! He does eat them now! We have one in our garden in Cape Town Bob and our little 2 year old grandson munches them straight from the tree until the red-purple juice makes him look like a vampire! I fed my silkworm on mulberry leaves as a child and they spun beautiful golden silk. Stunning photography.